Families, prepare to embark on the adventure of the summer: Dinosaur World Live is roaring back into London, and if its run at Regent’s Park Open Air Theatre last year is anything to go by, it’s going to be the (tricera)tops for young and old alike. Dinosaur World Live will play a seven-week summer season at the Troubadour Wembley Park Theatre from Thursday 18 July until Sunday 1 September. The show is both educational and entertaining, suitable for all ages 3 and up. Dinosaur World Live invites theatregoers to join upcoming palaeontologist Miranda, who grew up on a remote island surrounded by dinosaurs, on an exciting expedition to meet her Jurassic pals: the Giraffatitan, Microraptor, Segnosaurus, Triceratops, and everybody’s favourite ‘saur, the gigantic Tyrannosaurus Rex. Each performance of the show will be followed by a post-show meet and greet, where audience members have the chance to get up close to the remarkably life-like dinosaurs, brought to life by much of the team behind the world-famous War Horse puppets. The cast is led by Lucy Varney as Miranda, alongside a team of adroit puppeteers. 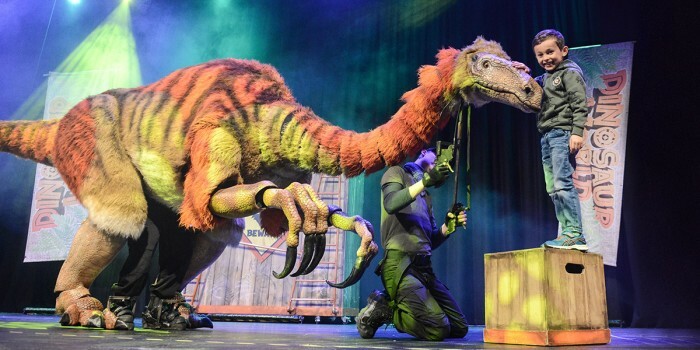 Having enjoyed a UK tour and a smash-hit season at Regent’s Park, Dinosaur World Live will become one of the first shows to play at the newly-opened Troubadour Wembley Park Theatre. The venue is a new, fully-flexible performance space launched this year as part of an upcoming cultural neighbourhood. Other upcoming shows there include the return of National Theatre hit War Horse to London.